My husband loves si mian soup and I am addicted to the house soup Zen’s serves. The other day I came up with a recipe that satisfied both of our cravings. 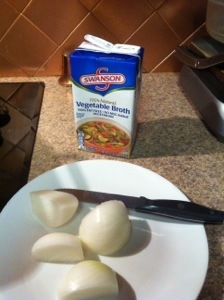 In a large soup pot add 32 ounces vegetable broth, 1 onion peeled and quartered. 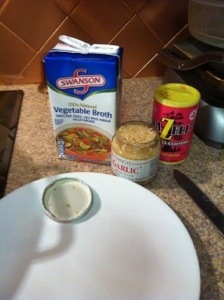 Season with 1 teaspoon Beazell’s Cajun Seasoning and 1 tablespoon minced garlic. 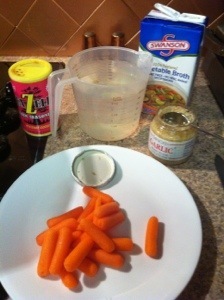 Add a handful of baby carrots to broth and 32 ounces water. 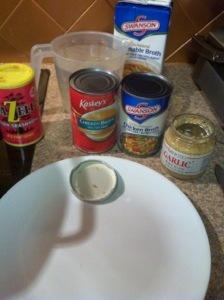 Add 32 ounces of chicken broth and season with a little more Beazell’s. Add 64 ounces beef broth. 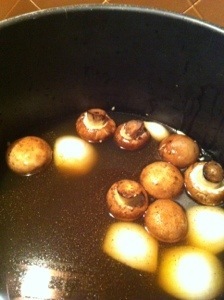 Add 1 small container of washed mushrooms and 1 pound boneless chicken breasts. 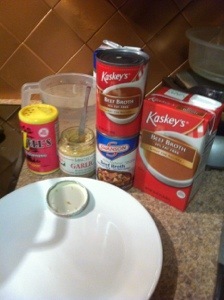 Season a little more with Beazell’s and simmer for another hour. Turn up heat and reduce for approximately 15 minutes. Remove chicken breasts and strain soup. 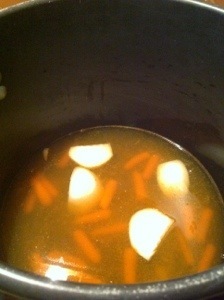 Dice chicken and add to strained broth. We like udon noodles. 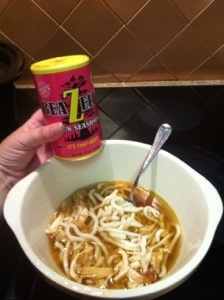 I purchased an udon noodle soup base from the grocery store, and added the seasoning packet to the broth also. Add udon noodles to bowl and pour broth with chicken over noodles. I added sliced mushrooms, chopped green onions and French fried onions to my bowl of soup. I also like to add a drop of soy sauce to mine.